Phoenix International Publications is proud to announce the launch of its first line of Encyclopaedia Britannica Kids branded children’s books at retail. Encyclopaedia Britannica is a global digital media company with online products that promote knowledge and learning. Britannica brings over 240 years of experience producing the most trusted and authoritative information in the world. Encyclopaedia Britannica Kids: Listen & Learn Board Book (18 months+). Learn all about your favorite farm animals in one book! Press one of 10 buttons to hear the different animal names and sounds. Can you hear the difference between a sheep and a cow? Encyclopaedia Britannica: Book, Box & Plush sets (18months+). This series will launch with two boxed plush sets, Super Sharks and Great Big Grizzlies. Each set will contain a small board book with three fun sound buttons, as well as a cuddly plush. Super Sharks will include a shark plush, while Great Big Grizzlies comes with a cute brown bear plush. Encyclopaedia Britannica Kids: Look & Find (5+). Can you spot the wildebeest in the savanna or the tortoise in the desert? Did you know that a coral reef can grow into a permanent coral island? Now you do! Throughout the eight beautifully illustrated spreads, you can explore different parts of the world while learning all about the different animals that live here. Encyclopaedia Britannica Kids: Brain Games (5+). Power-up your brain with these fun activities that stimulate your senses! With more than a dozen types of puzzles, including jigsaws, word scramblers, Sudoku-style squares, hidden differences, crosswords, and anagrams, this is sure to keep your child entertained while testing his or her knowledge of outer space, technology, transportation, athletes, artists, and animals! This book is loaded with STEM activities, including math and logic puzzles, problem solving, and number and word patterns. Encyclopaedia Britannica Kids: Sound Treasury (3+ years). An A-Z book of animals! Learn all about animals from alligator to zebra and in between! As you browse the 17 spreads of beautiful animal photographs, you can press one of 39 buttons to hear real animal sounds. Learn fun facts, such as animal behaviors, where they live, and more! Encyclopaedia Britannica Kids: My First Library (10 months+). Explore the natural world with 12 engaging board books perfect for the youngest learners to hold. By looking at the captivating images, your child will learn the difference between a waterfall and a canyon, as well as other fun facts. The set of books, consisting of Animal Colors, Baby Animals, Animal Homes, Nature Shapes, Nature by Touch, Morning to Night, Nighttime Animals, Caterpillar to Butterfly, In the Sky, Under the Ground, Weather, and Land and Water, come packaged in an easy-to-hold carrying box. Encyclopaedia Britannica Kids: Quiz it Pen Box Set (3+ years). Learn amazing animal facts with this boxed set that comes with four quiz books: Mammals, Slither, In the Sky, and In the Water. Each book contains over 500 interactive, analytical questions and answers that sharpen STEM skills. Get instant answers with the customized talking “yes-no” answer pen that lights up! Easily adjust the pen volume with four settings. Included is a 6-month free subscription to EB Kids Online®. The product line is now available at Toys R Us, Kohl’s, Costco U.S., Costco Canada, Indigo Books, Zulily and other leading retailers. 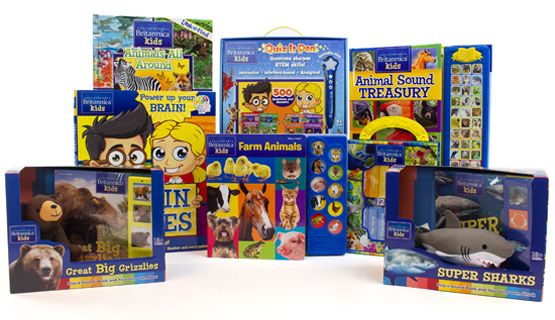 These books will add to the existing Encyclopaedia Britannica and Britannica Kids–branded educational products sold at retail and online, including the previously launched Britannica Interactive Animal Library, Britannica Interactive Science Library, Britannica World Information Atlas, the Britannica U.S. Talking Puzzles, the Britannica Kids: U.S. Presidents app on iTunes, and the Encyclopaedia Britannica Art Collections on www.art.com, www.allposters.com, and www.greatbigcanvas.com. Phoenix International Publications, Inc., headquartered in Chicago, Illinois, is the publisher of pi kids® books, and is a recently acquired division of Phoenix Publishing & Media Group (PPMG), the largest publishing company in China, headquartered in Nanjing, China. pi kids (www.pikidsmedia.com) is formerly the children’s division of Publications International, Ltd., a long-time leader in the field of interactive sound storybooks for young readers. Licensing partners include Disney, Nickelodeon, and Sesame Workshop. pi kids is a trademark of Phoenix International Publications, Inc., and is registered in the United States. Posted by Phoenix International Publications on November 15, 2016.